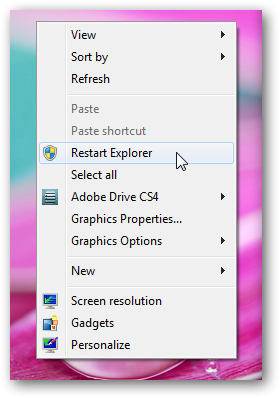 This time, we will show you the way to get an option to restart Explorer.exe from right click context menu in Windows 7 . Now, how to get it. Two parts : part one is creation of a batch file and part two is a Registry key. echo Kicking Explorer . . .
echo Kicking again to start the Explorer . . .
We have told many times, again repeating it: save the file as Restart_Explorer.bat and do not forget to change the file type from text to All files from drop down menu in Notepad before saving it. Restart_Explorer.bat is just a name; we could have name it Water_Bottle.bat ; but in that case we have to the rename in next step. Place it in C partition, again you can place it anywhere, but have to mention in Registry file. There is no rocket science in the above thing. You can change the red texts as you want. For God sake, do not change the format and the blue texts. Nothing will work then. Important: Double click to check whether it is working. This will add the functionality to get working from right click context menu. The green texts depend on your wish. As we said ago; we could have name it Water_Bottle.bat; then it will be that. The pink text is the location of the vbs file; you can change it as well. Frankly, we have not tested in other complicated ways, we have used conventional location. Save the file as Restart Explorer.reg and do not forget to change the file type from text to All files from drop down menu in Notepad before saving it. Name does not matter here at all. You can save as Peanut.reg and it will work. Now, double click the reg file and accept the security warnings and you will see the option in right click context menu when clicked on a folder or any empty place inside folder or Windows 7 desktop. Add a minus sign before the H starts after the third bracket; like [-HKEY_CLASSES…. to all where there is HKEY and save it (with some good name) as reg file and run it. It will break the association; so the option will disappear from right click context menu. Obviously, you might delete the bat file manually too. As usually all the required files are here for your download. The rar file is password protected, type thecustomizewindows.com as the password. This Article Has Been Shared 7868 Times! Get an option in right click context menu in Windows 7 to toggle between normal multiple selection holding the CTRL key and just clicking the right click menu option to switch between these two options. Safely remove hardware option in right click context menu will enable you to remove any USB devices just from right click option. Get an option in Windows 7 right click menu click it and type whatever you want to make your computer speak. Your computer will speak as you want while shutting down along with a timer. Microsoft Anna’s voice will speak as you like while shutting down. After reading this tutorial, you will get an option in the right click context menu, click which your computer will speak the current time by your clock. Many thanks for the tips. It will be very helpful for the users. I will add it to the post. Cite this article as: Abhishek Ghosh, "Add restart explorer option in right click context menu in Windows 7," in The Customize Windows, May 12, 2011, April 24, 2019, https://thecustomizewindows.com/2011/05/add-restart-explorer-option-in-right-click-context-menu-in-windows-7/.